After reading about how much Ariana at Becoming-Mom loves Happy Baby baby food, I saw this deal and had to post it! 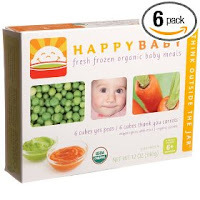 For the month of June, you can save 35% on select Happy Baby frozen organic baby food with coupon code HAPPY609. Shipping is free, too! You must spend at least $49 to get the discount, but this isn't the cheapest baby food you can find, so you shouldn't have any trouble spending the minimum amount!